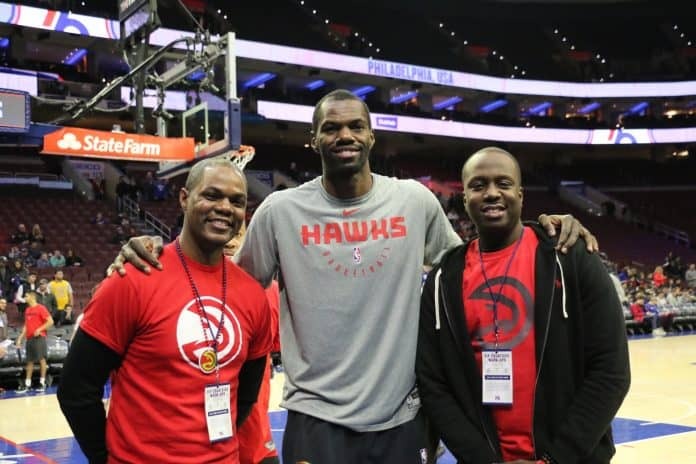 Atlanta Hawks game attendees (from the left) are: Christopher Thomas, Dewayne Dedmon, and Sekou Langevine. ATLANTA, Ga. — Kumho Tire and pro basketball’s Atlanta Hawks have donated an all-expense paid trip to Big Brothers Big Sisters of Metro Atlanta (BBBSMA), in celebration of National Mentoring Month. January is National Mentoring Month, so Big Brothers Big Sisters of Metro Atlanta (BBBSMA) is celebrating its current volunteers as mentors, “Bigs,” and also recruiting new volunteers. Two dedicated mentors who have gone above and beyond to positively impact the lives of Atlanta youth were selected to watch the Hawks take on the 76ers in Philadelphia. Those two mentors, Christopher Thomas and Sekou Langevine, were able to sit courtside during shoot-around and meet basketball-great Dominique Wilkins, plus a few current Hawks players. The two, and one additional mentor, received a new set of tires, courtesy of Kumho Tire. On January 21 at the MLK game, the Hawks welcomed 50 Bigs and Littles to the game versus the Orlando Magic. More than 500 youth in Metro Atlanta are waiting to be matched with a Big Brother or Big Sister. The only way to ensure they have someone to inspire them to reach their potential is for more adults to step up and volunteer to become Bigs. Being a Big means committing to spending a few hours a month with a young person doing things that you love to do, like playing basketball, visiting the library, or learning how to cook. Founded in 1960, Kumho Tire has more than 50 years of history immersed in an innovative approach to product development, market expansion, technical progression and environmental awareness, that has positioned the company as one of the world’s top tire manufacturers. Kumho Tires are distributed in 160 countries. The company is dedicated to providing an exceptional driving experience for consumers and optimal service for its customers worldwide. Headquartered in Atlanta, Georgia, Kumho Tire USA is the U.S. sales, marketing, product development and distribution arm of Kumho Tire Co., Inc. For more information, please visit www.KumhoTireUSA.com. Follow Kumho Tire on Facebook.com/KumhoTire, Instagram instagram.com/kumhotireusa and on Twitter @KumhoTireUSA. For 59 years, Big Brothers Big Sisters of Metro Atlanta (BBBSMA) has transformed the lives of some of the most vulnerable children in our community, through a proven youth development strategy: one-to-one mentoring. The mission of Big Brothers Big Sisters is to provide children who are facing adversity, with strong and enduring, professionally supported one-to-one relationships that change their lives for the better, forever. The agency serves approximately 1,400 children from 12 metro Atlanta counties on an annual basis.